OCast rodavallo, L. Psetta Maxima or Scophtalmus maximus, Eng. turbot. It is an almost round, scaleless flat-fish ranging from grayish to light brown and having darker markings. Its body is covered with conical bony knots or tubercles. The largest are 40” long and weigh 55 lbs. Their two eyes are normally on the left side of the head. Villena listed them as fish eaten in Spain. They are found around the gravel and sand of shores on European coasts of the Atlantic and Mediterranean. They are abundant around Malaga and Granada. 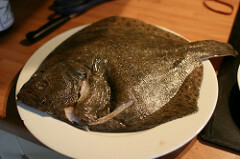 Most turbot sold in England comes from Dutch waters. Since the beginning of the 15th C. documents from both England and Spain show great esteem for them as food. In 1501 they were in a second group of fish, priced at 5 mrs. the pound of 32 ounces and in 1516 and 1524 at 12 mrs. They considered as expensive as lobster. Slices were served for dinner and supper. In the 15th C the English fried them slowly after dipping them in raw eggs and seasoning them with salt, pepper and nutmeg and served them with a bitter sauce. They were also spit roasted. It was common to boil the livers in stock. The Spaniards baked them in a bed of thyme, parsley, rosemary, mint, a couple of bay leaves and onion. They were common in Parisian kitchens. Slice eggplants in half. Make cris-cross incisions in the meat of the plant. Sprinkle with sea salt. Place face down on paper towels and let bleed for 20 minutes at least. Wash, boil and fry fish. 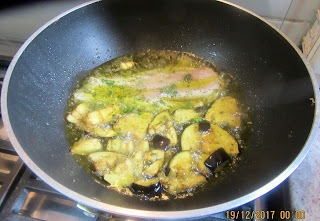 Slice without removing skin and fry eggplant with the fish and add seasoning.